Peptidergic neurons containing the melanin-concentrating hormone (MCH) and the hypocretins (or orexins) are intermingled in the zona incerta, perifornical nucleus and lateral hypothalamic area. Both types of neurons have been implicated in the integrated regulation of energy homeostasis and body weight. Hypocretin neurons have also been involved in sleep-wake regulation and narcolepsy. We therefore sought to determine whether hypocretin and MCH neurons express Fos in association with enhanced paradoxical sleep (PS or REM sleep) during the rebound following PS deprivation. Next, we compared the effect of MCH and NaCl intracerebroventricular (ICV) administrations on sleep stage quantities to further determine whether MCH neurons play an active role in PS regulation. Here we show that the MCH but not the hypocretin neurons are strongly active during PS, evidenced through combined hypocretin, MCH, and Fos immunostainings in three groups of rats (PS Control, PS Deprived and PS Recovery rats). Further, we show that ICV administration of MCH induces a dose-dependant increase in PS (up to 200%) and slow wave sleep (up to 70%) quantities. These results indicate that MCH is a powerful hypnogenic factor. MCH neurons might play a key role in the state of PS via their widespread projections in the central nervous system. In the middle of the last century, a series of historical observations lead to the discovery of a sleep phase in humans and other mammals paradoxically characterized by cortical activation and rapid eye movements, and associated with a complete disappearance of the muscle tone [1–3]. This phase of sleep, coined paradoxical sleep (PS) or rapid eye movement (REM) sleep was then demonstrated to correlate with dream activity [3, 4]. It was soon reported by Jouvet  that the state of PS is still present in "pontine cats" in which all structures rostral to the brainstem have been removed. This seminal experiment demonstrated that the brainstem contains the structures responsible for the generation of PS. Following this clear-cut demonstration, the potential role of the forebrain has therefore been poorly studied. However, a few studies suggest that the posterior hypothalamus might play a role in PS homeostasis. It has been shown that reversible inactivation of the lateral hypothalamic area by muscimol (a GABAa agonist) applications induces a disappearance of PS . In addition, neurons specifically active during PS have been recorded in the same area [7, 8]. Finally, it has recently been shown that narcolepsy, a sleep disorder characterized by excessive daytime sleepiness and cataplexy, is due to the lack of hypocretin mRNA and peptides in Humans  or a disruption of the hypocretin receptor 2 or its ligand in dogs and mice [10, 11]. Interestingly, hypocretin neurons are localized exclusively in the dorsomedial, lateral and perifornical hypothalamic areas . Neurons containing another peptide, melanin-concentrating hormone (MCH), co-distributed with hypocretin neurons could also play a role in PS control. Indeed, like the hypocretin neurons, they send strong projections to brainstem structures responsible for the onset and maintenance of PS [12–14]. Moreover, abundant putative contacts between both types of neurons have been observed, suggesting that both populations may interact at the hypothalamic level . 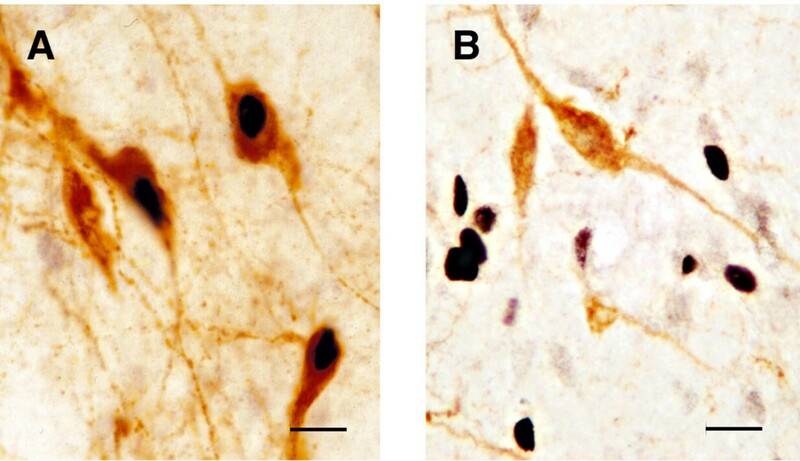 To determine whether the neurons from the lateral hypothalamic area and the perifornical nucleus and more specifically those containing hypocretin and MCH are indeed implicated in PS homeostasis, we combined Fos, hypocretin and MCH immunohistochemistry in rats deprived of PS, with enhanced PS during rebound after PS deprivation and in control condition. We chose this method because the examination of Fos, the product of the immediate early gene cfos that is expressed in association with neuronal discharge and entry of Na+ and Ca2+ ions, is now well-accepted to study neuronal activity [16, 17]. In addition, it has been recently and successfully used to localize and characterize the chemical identity of the brainstem neurons responsible for PS generation [18–20]. Using this method, we found that the large majority of MCH, but not hypocretin neurons are immunoreactive to Fos specifically after PS hypersomnia. To further determine whether MCH play a direct role in PS regulation, we designed a second series of experiments in which we compared the effect on the sleep-waking cycle of ICV injection of different doses of MCH with that of NaCl injections. 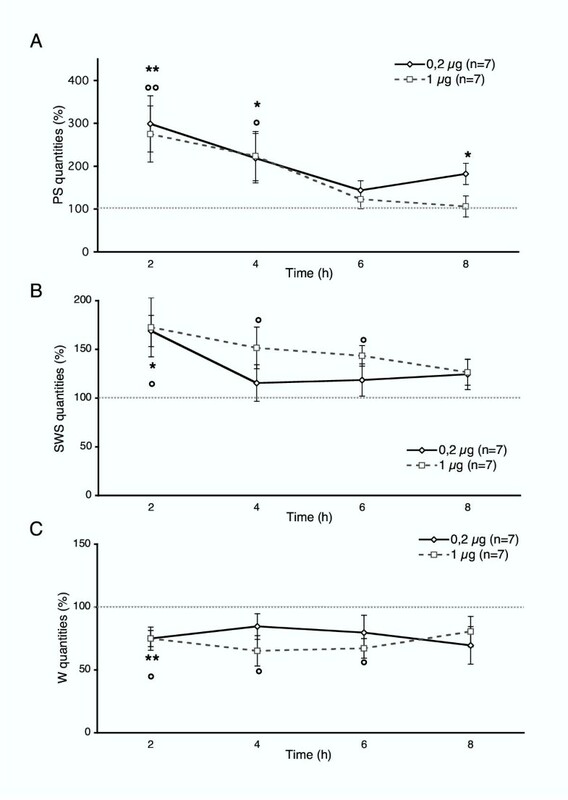 The PS deprivation procedure was effective in producing a near complete elimination of PS in the group of rats perfused after the 72 h of deprivation (PSD group) and also in that subjected to the same deprivation and then allowed to recover for three hours before perfusion (PSR group). These two groups of rats presented no significant difference in their quantities of PS (PSD: 4.4 ± 2.5 min, PSR, 4.8 ± 3.0 min), SWS (PSD: 1348.5 ± 80.0 min, PSR, 1375.6 ± 136.6 min) and W (PSD: 2965.9 ± 83.2 min, PSR, 2929.3 ± 129.2 min) during the 72 h of deprivation. During the 150 min prior to sacrifice, the quantities of PS were significantly different in the PSD and PSR groups and in the group of control animals (PSC group) (p < 0.05). The state of PS constituted 16 % of the last 150 minutes prior to sacrifice in the PSC group, 0 % in the PSD group and 44 % in the PSR group (Table 1). There was a significant decrease in the time spent in slow wave sleep (SWS) in PSD (30 %) and PSR (33 %) conditions as compared to the PSC (48 %) condition (p < 0.05). The PSD group presented a large quantity of waking (W) (70%) compared to the PSC (36%) and PSR (23%) groups. The increase in PS quantities during the last 150 minutes prior to sacrifice in the PSR group compared to the PSC group was due to a significant increase in the duration of the PS bouts (PSC, 1.2 ± 0.1 min; PSR, 2.5 ± 0.2 min) (p < 0.001). The number of bouts did not vary significantly between the two groups (PSC, 21.2 ± 2.3; PSR, 27.2 ± 3.9). Sleep stages quantities and cell counts for control (PSC), PS deprived (PSD) and PS recovery (PSR) groups. Time spent in W, SWS and PS is reported in minutes, scored per 10 sec epochs over the last 150 minutes of the experiment. The number (mean ± SEM) of Fos+, MCH+, Hypocretin+ and double-labeled neurons (Hypocretin+/Fos+ or MCH+/Fos+) was calculated in the posterior hypothalamus for control (PSC, n = 4), PS deprived (PSD, n = 4) and PS recovery (PSC, n = 4) rats. Cells were counted on 4 and 6 hemi-sections per animal for Hypocretin/Fos and MCH/Fos labelings respectively. Significance values indicated for individual points are: ¶ p < 0.05 and ¶¶¶ p < 0.001 between PSD and PSC, * p < 0.05 and *** p < 0.001 between PSR and PSC, ## p < 0.01 and ### p < 0.001 between PSR and PSD conditions. The number of Fos+ neurons located in the posterior hypothalamus as a whole was highly significantly increased in the PSR group compared to the PSC and PSD groups (Figs. 1 and 2) (Table 1). The mean number of Fos+ neurons was superior in the PSD group compared to the PSC group but it did not reach statistical significance (Table 1). Across conditions, the number of Fos+ neurons in the posterior hypothalamus was positively correlated with the percent PS (R = 0.648, p < 0.05) and showed no correlation with the percent wake (R = 0.337) or the percent SWS (R = 0.418). Photomicrographs of double-immunostained sections from a rat belonging to the PS-Recovery condition. A, Three double-labeled MCH+/Fos+ cells with their cytoplasm colored in brown and their nucleus labeled in black and one single labeled MCH+ cell. B, Fos+ (with a black nucleus) and hypocretin (with a brown cytoplasm) single labeled cells. Scale bars: 20 μm. Schematic distribution of Fos+ (grey dots), MCH+ (black dots) and MCH+/Fos+ (red dots) neurons on two coronal hemi-sections of the hypothalamus in a representative animal for PS-Control (A1, A2), PS-Deprivation (B1, B2) and PS-Recovery (C1, C2) conditions. Note the very large number of MCH+/Fos+ cells specifically in the PSR condition. Abbreviations: Arc, arcuate nucleus; DA, dorsal hypothalamic area; DMH, dorso-medial hypothalamic area; f, fornix; ic, internal capsule; LHA, lateral hypothalamic area; mt, mammillothalamic tract; opt, optic tract; PeF, perifornical area; VMH, ventro-medial hypothalamic area; ZI, zona incerta. The largest number of Fos+ neurons in the PSR group was localized in the lateral hypothalamic area (151.6 ± 12.2 neurons per hemi-section). A substantial number of labeled cells was also observed in the rostral part of the zona incerta (77.0 ± 17.6 neurons per hemi-section), perifornical nucleus (55.7 ± 4.9 neurons per hemi-section), dorsal hypothalamic area (56.2 ± 9.7 neurons per hemi-section) and ventromedial hypothalamic nucleus (50.0 ± 15.7 neurons per hemi-section). A small number of cells was localized in the dorsomedial hypothalamic nucleus (36.7 ± 6.8 neurons per hemi-section) and the caudal part of the zona incerta (22.5 ± 3.6 neurons per hemi-section). 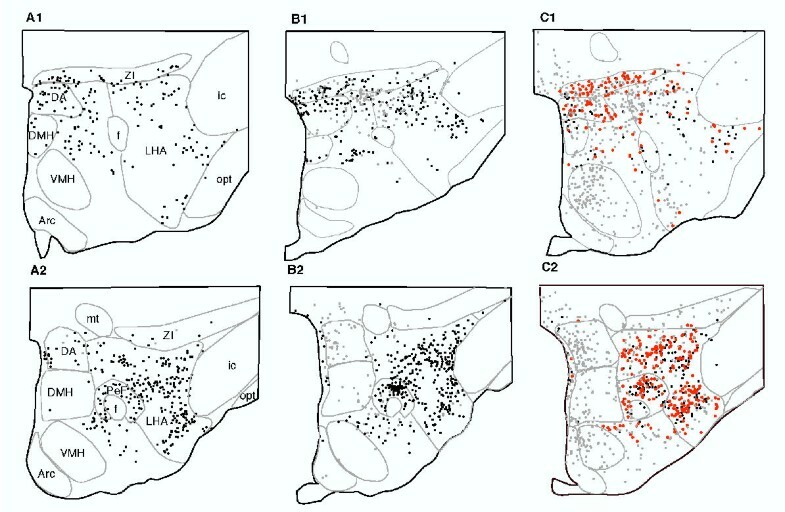 In all these structures, excepting the lateral and dorsal hypothalamic areas, the number of Fos+ cells in the PSC and PSD group was very limited and not statistically different between the two groups and significantly inferior to the PSR group. In the lateral and dorsal hypothalamic areas, the number of Fos+ neurons was significantly superior in the PSD group compared to the PSC group (p < 0.05) and significantly inferior compared to the PSR group (P < 0.05). In all groups, the arcuate nucleus of the hypothalamus contained only a few Fos+ cells. In all groups, only a few to occasional hypocretin neurons expressed Fos (PSR, 2%; PSD, 3%; PSC, 0.1% of all the hypocretin neurons counted) (Fig. 1A) (Table 1). The number of Hypocretin+/Fos+ cells was neither correlated with the percent waking (R = 0.396), the percent SWS (R = -0.455) nor the percent PS (R = -0.19). In contrast to hypocretin, the majority of the MCH+ cells were immunoreactive to Fos in the recovery condition (Fig. 1B, Fig. 2C) whereas only a few were Fos+ in the deprivation and control conditions (PSR, 58%; PSD, 0.2%; PSC, 0.1% of all the MCH neurons counted) (Fig. 2) (Table 1). Across conditions, the number of MCH+/Fos+ cells was significantly and positively correlated with the percent time spent in PS (R = 0.917, p < 0.0001) and negatively correlated with the percent waking (R = -0.65, p < 0.05). It was not significantly correlated with the percent SWS (R = -0.28). In the PSR condition, the MCH+/Fos+ neurons made up for 76 % of the Fos+ neurons localized in the perifornical area, 60% of the Fos+ neurons in the lateral hypothalamic area and 34% of the Fos+ neurons in the rostral zona incerta. The injection of 0.02, 0.2, 1 and 5 μg of MCH into the left lateral ventricle of rats at dark onset induced a dose-dependant and significant increase in the amount of PS (Fig. 3, Table 2). Injection of 10 μg of MCH had no significant effect. The strongest increases in PS quantities were obtained with 0.2 and 1 μg MCH doses. The maximum increase with these two doses compared to NaCl was seen during the first two hours (0.2 μg, 198%; 1 μg, 174%) (p < 0.01). The increase of PS quantities following 0.2 and 1 μg injections was visible during 8 and 4 h, respectively (Fig. 3, Table 2). The injection of 0.02 μg of MCH induced a smaller increase in PS quantity compared to NaCl with a maximum increase again during the first two hours (137%) (p < 0.05). With this dose, PS quantities remained significantly increased only during the first four hours compared to saline. The 5 μg MCH dose significantly increased PS quantities compared to NaCl but only during the third and fourth hours (119%)(p < 0.01). Increase of paradoxical sleep and slow wave sleep quantities by ICV administration of MCH. Administration of 0.2 μg (black line) and 1 μg (dashed line) of MCH induceda strong increase in the quantities of PS (A) and SWS (B) and a decrease in W (C) in male rats compared to NaCl (dotted line). The values are normalized to NaCl, NaCl corresponding to 100% of PS (A), SWS (B) or W (C). Significance values indicated for individual points are: 0.2 μg MCH versus NaCl ( * p < 0.05, **p < 0.01), 1 μg MCH versus NaCl (° p < 0.05, ° °p < 0.01). For the 0.2, 1 and 5 μg doses, the increase in PS quantities was due to an increase in the number of bouts of PS and not in their duration (Fig. 4). In the case of the 0.02 μg injections, the number of bouts and their duration were not significantly modified. For all doses, the latency of the first PS episode was unchanged compared to NaCl. Increase in the number of PS bouts after ICV administration of MCH. Histograms illustrating the number of PS bouts (A) and their duration (B) during the first four hours following ICV administration of NaCl, 0.02, 0.2,1, 5 or 10 μg of MCH (mean ± SEM). There is a significant difference in the number of PS bouts between NaCl and MCH injections for 0.2, 1 and 5 μg. No difference in PS bouts duration was observed. Significance values indicated are for MCH versus NaCl injections ( *p < 0.05, **p < 0.01, ***p < 0.001). In addition to the effect on PS, a significant increase in SWS and a decrease in W quantities were obtained after administration of 0.2 and 1 μg of MCH compared to NaCl (p < 0.05) (Fig. 3, Table 2). Injection of 10 μg of MCH also induced an increase in SWS and a decrease in W quantities compared to NaCl, which did not reach statistical significance. No effect on SWS and W was seen with 0.02 and 5 μg doses compared to NaCl. The increase in SWS quantities following 0.2 and 1 μg MCH injections was maximal during the first two hours (0.2 μg, 69%; 1 μg, 73%) (p < 0.05) (Fig. 3, Table 2). The maximum decrease in W amounts was seen during the first 2 hours for 0.2 μg (-25%) and the third and fourth hours for 1 μg (-35%). The 0.2 and 1 μg MCH injections significantly increased SWS and decrease W quantities during 2 and 6 h compared to NaCl, respectively (Fig. 3, Table 2). In the present study, we found that a large majority of the MCH but not the hypocretin neurons were strongly immunoreactive to Fos specifically after a PS hypersomnia following 72 h of PS deprivation. Both types of cells were not immunoreactive to Fos in control condition or after the 72 h PS deprivation. Further, we found that ICV administration of 0.02, 0.2, 1 and 5 μg of MCH induces a dose dependent increase in PS and, to a minor extent, SWS quantities. Our study is the first reporting the presence of Fos-immunoreactive neurons in the posterior hypothalamus after PS rebound. Indeed, previous studies examining Fos expression after PS hypersomnia focused on the brainstem [18–20]. Our results suggest that MCH neurons and also other populations of neurons intermingled with them and in adjacent structures, like the dorsal hypothalamic area, are specifically active during PS. They are supported by electrophysiological studies showing the presence of neurons strongly active during PS in the posterior hypothalamus [7, 8]. Our results also indicate that hypocretin neurons are inactive during PS. They are in agreement with previous studies showing that Fos expression in hypocretin neurons is correlated positively with the amount of W and negatively with the amounts of SWS and PS during the 2 h prior to sacrifice . Altogether, these and our results indicate that hypocretin are active during W and inactive during SWS and PS, while MCH neurons are active during PS. The next step is to determine the role(s) of the MCH neurons during PS. It is unlikely that they are responsible for PS onset and maintenance since it is well accepted that PS generating structures are restricted to the brainstem . However, MCH neurons could play a role in PS homeostasis. Indeed, reversible inactivation, by muscimol (a GABAa agonist) applications, of the region containing the MCH neurons induces a disappearance of PS . Further, MCH fibers and receptors are present in the brainstem, in particular in reticular structures known to trigger PS like the sublaterodorsal, dorsal raphe nucleus and locus coeruleus nuclei . To test the hypothesis that MCH neurons play a role in the homeostasis of PS, we studied the effect of ICV administrations at dark onset of MCH. Dark onset was chosen because the quantities of SWS and PS are minimal at this circadian time and an increase in their quantities was therefore more likely to be unraveled. We found that such injections induce a dose-dependant increase in PS and, to a minor extent, SWS quantities. These pharmacological results suggest that MCH neurons directly regulate PS and SWS quantities. The mechanism of action remains to be determined. One possibility is that MCH increases PS via a direct excitation of the brainstem PS inducing neurons (PS-on neurons), in particular those located in the sublaterodorsal nucleus . This seems however quite unlikely because MCH has been shown to be an inhibitory peptide [24, 25] and GABA has been shown to be co-localized with MCH . It is therefore more likely that MCH neurons promote PS indirectly by inhibiting neurons themselves inhibiting the PS executive neurons during W and SWS (PS-off neurons). The monoaminergic neurons in the brainstem and the histaminergic neurons in the caudal hypothalamus belong to this category. They are active during W, decrease or nearly cease their activity during SWS and are silent during PS [7, 27, 28]. In previous studies, we have shown that GABA tonically inhibits the pontine PS executive neurons localized in the sublaterodorsal nucleus . Further, we localized in the ponto-mesencephalic reticular formation the GABAergic neurons potentially responsible for this inhibition . The increase of PS induced by MCH could therefore also be due to a direct inhibition of these GABAergic neurons. Another possibility is that MCH neurons modulate SWS and PS quantities via an inhibitory action on the intermingled hypocretin neurons. Indeed, our and other  results indicate that hypocretin neurons are active during W and inactive during PS. In addition, disappearance of the hypocretins or invalidation of the receptor 2 for these peptides have been shown to induce narcolepsy in Human , mice  and dogs , the main feature of this disorder being sleepiness and PS attacks during W. Further, putative somasomatic, axosomatic and axodendritic contacts between hypocretin and MCH neurons have been observed, suggesting that MCH and hypocretin neurons are interconnected . From these and our results, it can be hypothesize that MCH neurons might provide a tonic inhibition of the hypocretin neurons and by this way promote sleep. Neurons containing MCH also project to forebrain structures such as the hippocampus and cortex [13, 30, 31]. Therefore, in addition to its role in PS homeostasis, the release of MCH on the cortical and hippocampal cells, specifically during PS, could also be involved in the induction of gamma and theta activities and oscillations observed on the EEG during PS. Additional studies are now necessary to determine the role of MCH release during PS in these brain territories. Besides, it has been previously shown that central administration of 1.5 or 5 μg of MCH stimulates food intake while 0.15 and 0.5 μg doses are ineffective . We found that lower doses (0.2 and 1 μg) more efficiently increase the quantities of PS, suggesting the existence of different modes of action of MCH on sleep and food intake. Additional studies are now necessary to unravel the link between the presumed role of MCH in sleep and nutritional homeostasis. In conclusion, our results indicate that MCH is a powerful peptidergic hypnogenic factor. They further suggest that MCH-containing neurons play a crucial role in PS homeostasis in addition to energy balance [32–36]. Since MCH increases the quantities of PS but also those of SWS, it will be of interest to determine whether MCH agonists could be useful to treat sleep disorders such as insomnia. All animals were housed and cared for according to the National Institute of Health "Guide for the care and use of laboratory animals" (NIH publication 80–23). Male Sprague-Dawley rats (280–320 g, n = 25; IFFA Credo) were prepared for electroencephalogram (EEG) and electromyogram (EMG) monitoring under chloral hydrate anaesthesia (400 mg/kg, i.p.) as previously described . They were placed under a 12 h/12 h light/dark cycle (lights on from 6:00 AM to 6:00 PM) and constant temperature (23°C) in a Plexiglas jar for at least 8 days of habituation. EEG and EMG recordings were collected on a computer via a CED interface using the Spike 2 software (Cambridge Electronic Design). Vigilance states were discriminated with the aid of EEG and EMG data as previously described . PS deprivation was performed during 72 h using the classical flowerpot method [18, 19, 37]. Food and water were accessible ad libitum to animals. A 24 h baseline recording was first performed for all animals. Then, the rats were divided in control (PSC, n = 4), PS deprivation (PSD, n = 4) and PS rebound (PSR, n = 4) groups. The animals of the PSC group remained in their recording jar for 5 days before anaesthesia and perfusion at 5:00 PM. The animals of the PSD group were placed on platforms (6.5 cm in diameter) over water at 1:00 PM for three days and then anesthetized and perfused at ≅ 4:30 PM. The animals of the PSR group were placed on platforms for 72 h of PS deprivation and then back in their home cage for ≅ 3 h to allow a recovery of PS. They were anaesthetized for perfusion 150 min exactly after the first PS episode. The PSC, PSD and PSR animals were perfused with a Ringer's lactate solution containing 0.1% heparin, followed by 500 ml of a fixative composed of 4% paraformaldehyde and 0.2% picric acid in 0.1 M phosphate buffer (PB, pH 7.4). Brains were postfixed for 2 h at 4°C and then stored for 2 days at 4°C in PB with 30% sucrose. The brains were rapidly frozen with CO2 gas, sliced in 25 μm-thick coronal sections, and stored in PB containing 0.9% NaCl, 0.3% Triton X-100 and 0.1% sodium azide (PBST-Az). They were successively incubated in (i) a rabbit antiserum to Fos (1:5,000; Oncogene) in PBST-Az for 3 days at 4°C; (ii) a biotinylated goat antirabbit IgG solution (1:2,000; Vector Laboratories); and (iii) an ABC-HRP solution (1:1,000; Elite kit, Vector Laboratories) both for 90 min at room temperature. Finally, the sections were immersed in a 0.05 M Tris-HCl buffer (pH 7.6) containing 0.025% 3,3'-diaminobenzidine-4 HCl (DAB; Sigma), 0.003% H2O2 and 0.6% nickel ammonium sulphate. Two washes of 30 min were performed between each step. The Fos stained sections were incubated the following day in a rabbit antiserum to either hypocretin (1:10,000; Phoenix Pharmaceutical) or MCH (1:100,000; Phoenix Pharmaceutical) in PBST-Az over 3 days at 4°C. Amplification steps were similar to those above but revelation was performed in DAB solution without nickel. Finally, the sections were mounted on slides, dried and coverslipped with DePex. Drawings of double-immunostained hemi-sections were made with a Leitz Orthoplan microscope equipped with an X/Y sensitive stage and a video camera connected to a computerized image analysis system (Historag, BIOCOM). Single and double-labeled neurons were counted in each hypothalamic structure present on one side of 6 MCH/Fos double-labeled sections and 4 hypocretin/Fos double-labeled sections. For all rats, a guide cannula was implanted into the left lateral ventricle. Animals were allowed to recover for 3 days and were handled daily during 5 days prior to injection to minimize non-specific stress. Five microliters of MCH (0.02 μg, n = 4; 0.2 μg, n = 7; 1 μg, n = 7, 5 μg, n = 9 and 10 μg, n = 5 dissolved in 0.9% saline) or saline (n = 13) were administered at the rate of 1 μl/min at the beginning of the dark period (6:00 PM), with a stainless steel injector placed in the cannula and connected to an Hamilton syringe (Hamilton, Bonaduz, AG) by polythene tubing (id, 0.5 mm; od, 1 mm). All animals received at least one saline injection and one dose of MCH. After injection, animals returned to their jars and vigilance states were recorded for 8 h. The placement of the cannula was verified at the end of the study by microscopic examination of coronal counterstained brain sections. ANOVA were performed on the different vigilance states across experimental conditions. A post hoc PLSD Fisher test was used to identify significant pairwise differences. The same tests were performed to compare cell counts between the animals groups in the different hypothalamic structures. Cell counts were correlated with physiological variables using a simple linear regression analysis. All statistics were performed using Statview 5.0. Quantities of PS, SWS and W after NaCl and MCH ICV injections. The quantities (mean ± SEM) of PS, SWS, and W following NaCl or MCH administrations are reported in minutes per 2 hours. Significance values indicated for individual points compared to NaCl are * p < 0.05 and ** p < 0.01. Laure Verret, Romain Goutagny contributed equally to this work. This work was supported by CNRS (FRE2469 and UMR5167), INSERM (U480) and Université C. Bernard Lyon I. L. Verret and R. Goutagny received a PhD grant from the "Ministère de la Recherche" and the "Région Rhône-Alpes", respectively. We thank N. Vautrelle and also J. Trouillas, B. Renaud for their help. LV carried out animal protocol for PS deprivation and rebound, immunochemistry, and performed statistical analysis for anatomical study. RG carried out animal protocol, implemented sleep studies and performed statistical analysis for ICV study. PF participated in the design of the animal protocols and anatomical studies. DS participated in the ICV study. PF and PHL conceived the studies. CP, LL and PS provided useful discussion. LC, LL, CP, PS and RB participated in the design and coordination of the studies. LV and PHL drafted the manuscript. All authors read and approved the final manuscript.